Caltech has announced the Caltech Space Challenge 2019, called Encelanders. 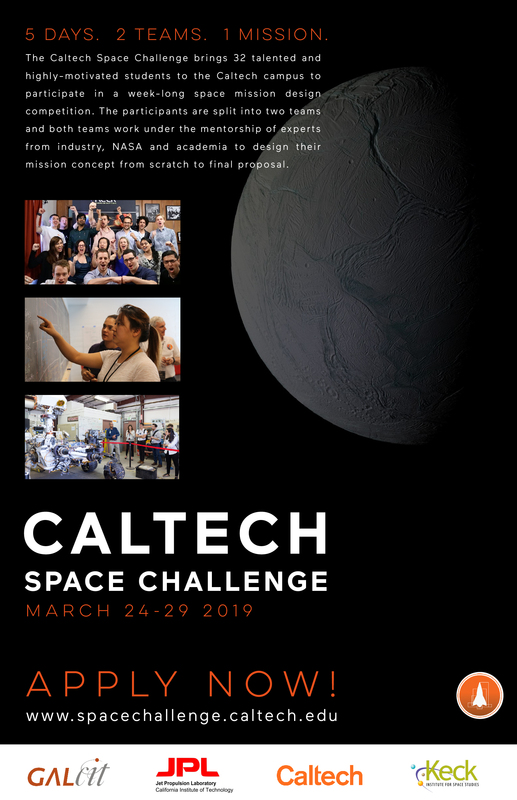 This is a 5 day event on Caltech’s campus from March 24-29. Undergraduate and graduate students from around the world are challenge to design a space-related mission. This year’s challenge focuses on missions to find traces of life on Saturn’s moon Enceladus. The mission will be based on a network of small landers to explore the sources of Enceladus’s geysers. All expenses while staying at Caltech are paid, and partial to full travel reimbursement is available depending on the cost of travel. Students from all backgrounds are encouraged to apply from STEM fields to graphic design and business/project management. If you are interested in learning more, please visit their website.